Are you trying desperately to become slim and failing? How many diets have you gone through? How many weight loss supplements have you tried? How many times did you decide to start exercising from the next day and didn’t? Well, if it’s sad for you to memorize it, let me ask something else. Have you ever heard about changing your eating environment than doing anything else to lose weight? 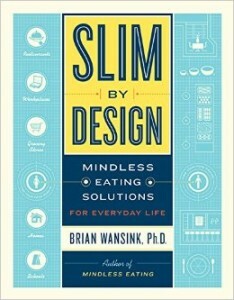 If not, read this easy solution to fix mindless eating and become slim, in the new book Slim By Design, by Brian Wansink. How to Change Eating Environment? 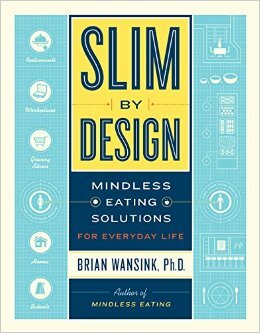 In his book Slim By Design, Brian Wansink suggests that rather than becoming slim by willpower, it’s easier to change your working environment. This means that you can remove the foods from your life rather than having them near you and controlling your cravings. He says that there are several solutions to mindless eating around us, but we don’t notice them. This is because we focus more on food than on our surroundings. We focus on what we ate, what we didn’t eat, how much we ate, what we avoided and many such things, in which “food” is the very topic of our thoughts. This means instead of removing food from our mind, we think more on it. Not everyone has such a strong willpower. Therefore an easier way that everyone can execute is to change her/his food environment. How can we do that? We can do it by grabbing a small plate at a buffet, serve ourselves salads first, move the bread basket away and so on. This automatically helps you eat less. In most people, willpower is in fact wimpy and life is full of weird situations where we can’t just control our cravings when foods are near us. 90% of people don’t find mindful eating as a solution to mindless eating. The solution is actually easy – to tweak small things in our homes, workplaces, restaurants, kids’ schools and supermarkets, so that we can mindlessly eat less and healthy instead of more and wrong. Using a small plate, using chopsticks instead of spoons and forks and sitting far away from food are easy tricks that we can apply rather than applying the hard-to-conquer willpower. The book also contains the interesting stories of how the author and his fellow researchers conducted researches on restaurant buffets and how they differentiated the habits of slim people and overweight people. The findings are interesting and you should read the book to know them! So, here is an easy way to become slim – Slim By Design! Read it and head towards shedding the extra pounds! Obesity and Diet Programs – Priority Is Health!